For news and resources, please click on the group name to visit that page! You can also find Jazz resources for all students below. Thank you to all who auditioned! The auditions were a tough process, but it is so evident how much you all have grown over the past year. I am very much looking forward to working with all of you in our concert choirs throughout next year. If it is possible, the goal is to find a spot for everyone where they can grow and be successful. I appreciate your patience and kindness with one another as you all know these decisions are very difficult to make, and we all understand that these can be tough situations emotionally. If you have any questions or concerns about your score, feel free to come see me. I have done my best to record scores and to organize data as effectively as possible, in order to be as accountable and fair as possible. Thanks so much for your dedication and spirit. Each of you, and our GVC Choir Family as a whole, has so much to be proud of! ​The students listed in each ensemble have signed a contract on their audition form. They have promised to be dependable, hard-working, and supportive team members. Maintaining their spot in the ensemble is dependent upon honouring their commitments. If they are unable to uphold this standard, they may forfeit their spot to another singer. These singers will be selected from the alternates. 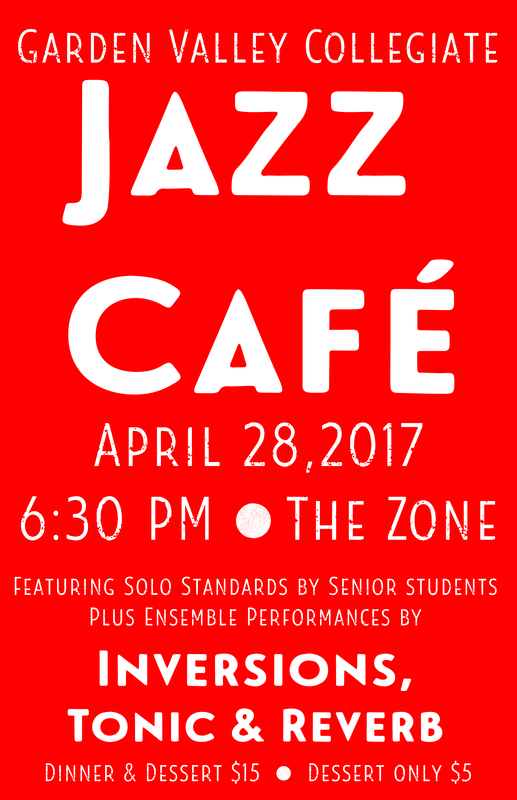 http://www.jazzstandards.com/ - A great resource for all things related to understanding and performing standards. http://www.vocaljazzcamp.com/ - Looking to improve your vocal jazz skills? This camp is held in Winnipeg each year for 1 week in August. Students have individual solo coachings and performances, sing in different ensembles, and participate in group theory and improv lessons. GVC may be able to offer partial scholarships to interested students. Speak with Mrs. U if interested!! Click on the following documents for an index of lead sheets, and listen to the Cool Jazz Vocal Jazz playlist to get inspired for your own Jazz Standard performance!